In addition to the conference social activities (welcome party, gala dinner, entertainment shows and soft animations at the venue hotel), the following social program and tours are on demand with payment. Supermag Inc. is the Official Organization Support & Handling Company of ICSM. For details of the daily tours and pre/post conference tours please see information below. 1- For each tour, there must be a minimum of 10 people signed-up. 2- You may sign-up before your arrival, no advance payment is needed. The white, foaming water of the Manavgat Waterfalls flows powerfully over the rocks. Near the waterfalls, there are shady tea gardens providing a pleasant resting place. The Oymapinar Dam is located 12 km (7 mi) to the north of the river. 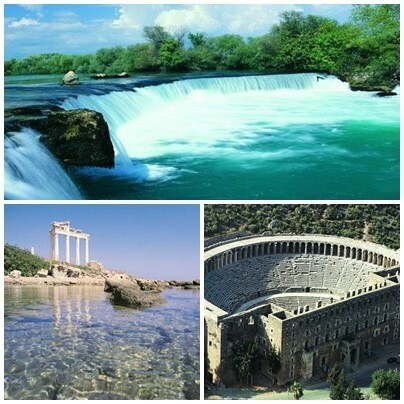 During floods, the Manavgat Falls may disappear under high water. Aspendos was an ancient city in Pamphylia, Asia Minor, located about 40 km east of the modern city of Antalya, Turkey. It was situated on the Eurymedon River about 16 km inland from the Mediterranean Sea; it shared a border with, and was hostile to, Side. According to later tradition, the (originally non-Greek) city was founded around 1000 BC by Greeks who may have come from Argos. The wide range of its coinage throughout the ancient world indicates that, in the 5th century BC, Aspendos had become the most important city in Pamphylia. At that time the Eurymedon River was navigable as far as Aspendos, and the city derived great wealth from a trade in salt, oil, and wool. Atatürk was responsible for much of the restoration, who after visiting it declared that it should be used as a theatre rather than simply a museum. 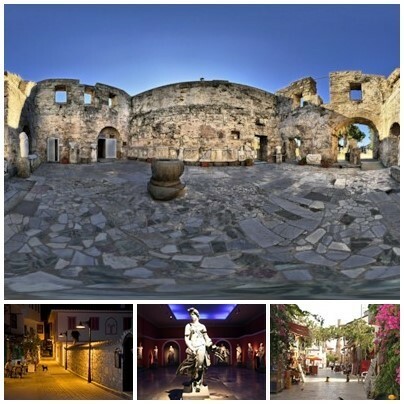 • Visiting World-famous and most protected theatre of the world Antique Theatre of Aspendos. A relaxing day trip where you can enjoy a swim in the Mediterranean, indulge in some sunbathing and experience a visit to the antique city of Phaselis. The Antalya Museum or Antalya Archeological Museum (Turkish: Antalya Müzesi) is one of Turkey’s largest museums, located in Konyaaltı, Antalya. It includes 13 exhibition halls and an open air gallery. It covers an area of 7,000 m2 (75,000 sq. ft.) and has 5000 works of art are exhibited. In addition a further 25,000–30,000 artifacts which cannot be displayed are in storage. As a museum exhibiting examples of works, which illuminate the history of the Mediterranean and Pamphylia regions in Anatolia, Antalya Museum is one of the most important of Turkey’s museums. Demre is a town and its surrounding district in the Antalya Province on the Mediterranean coast of Turkey, named after the river Demre. Demre is the Lycian town of Myra, the home of Saint Nicholas of Myra, the historical man later developed into the figure of Santa Claus. The district was known as Kale until it was renamed in 2005. A substantial Christian community of Greeks lived in Demre (Myra) until the 1920s when they were forced to migrate to Greece after the Population exchange between Greece and Turkey. The abandoned Greek villages in the region are a striking reminder of this exodus. 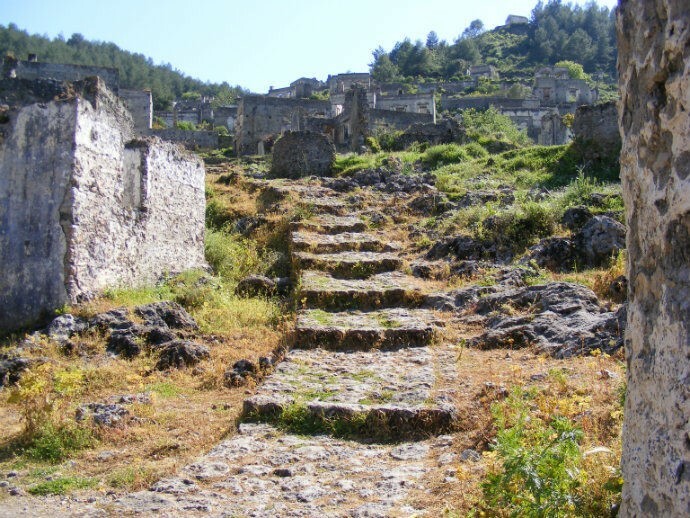 Abandoned Greek houses can still be seen at Demre and the regions of Kalkan, Kaş and Kaya which is a Greek ghost town. A small population of Turkish farmers moved into the region when the Greek Christians were forced to migrate to Greece. The region is popular for tourists. Particularly Christian pilgrims who visit the tomb of Saint Nicholas. Mount Tahtalı, located in Antalya-Kemer, with its height of 2365m is the mountain closest to the sea on the southern coastline of Turkey. Tahtalı embraces the view that surrounds Kemer, adored as a sea and vacation region, which is near the tourism metropolis, Antalya. Olympos is the 2nd highest Mounth of Beydağları National Park and sits on a throne as if a king between Antalya and Finike and is the most dominant mountain of the Beydağları mountain range. This extraordinary adventure, realizes the dream of going up to Tahtalı with the new cableway constructed and rights the slogan “Sea to Sky”. 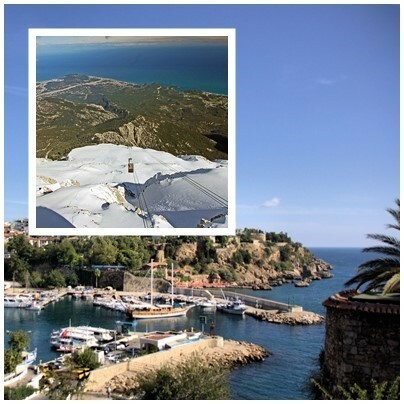 The Tahtalı cableway combines the two classic purpose of going on a vacation – the sea and the mountain- uniquely. Mount Tahtalı, aside from being located in an interesting tourism area, gains a quality of becoming a place that you just can’t do without visiting, with the newly constructed cableway. Köprülü Canyon take place high in mountains, 96km northeast of Antalya. It is one of the Turkey’s National Parks. Köprülü Canyon stretches for 14 km along the Köpru River and is 400 meters deep in some places. Above it there are ruins of the Roman city of Selge. This is the place for who like outdoor activities: Rafting in the mountains, hiking, or to explore the ruins of the Roman Theater, city walls, and Temple of Zeus in the mountain town of Selge (Altınkaya). Köprülü (Turkish: Köprülü Kanyon) is a canyon and a National Park in the Province of Antalya, Turkey. 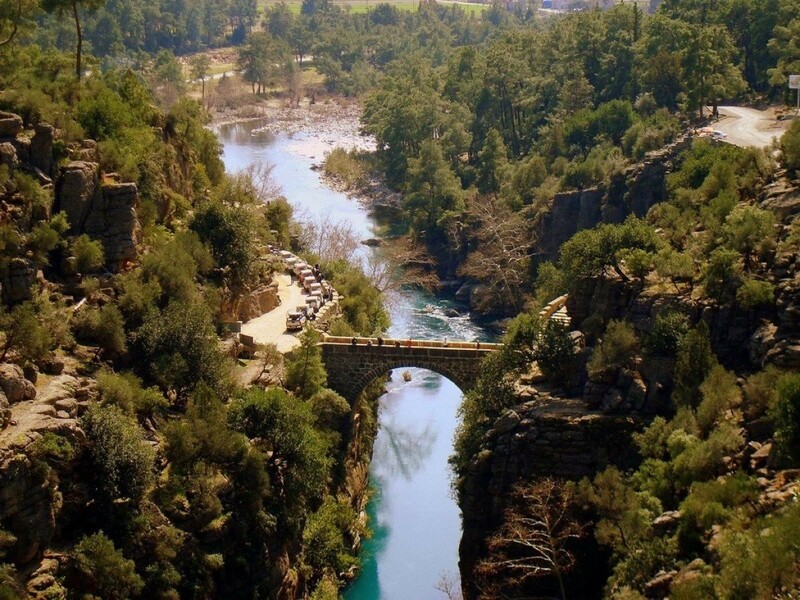 The canyon stretches for 14 km along the Köprü River and is 400 metres deep in some places. At the rest area there are fish restaurants offering delicious food especially fresh trout. The Roman Oluk Bridge over the canyon and the Bugrum Bridge over the Kocadere stream were engineering feats of their time. Morning departure from the hotel brings us to Koprulu River by around 10:30, where crystal clear water flows gently through the magnificent landscape of Koprulu Canyon National Park. The expert rafting guides brief the group on National Park safety procedures, and use of equipment. Participants may choose between an inflatable canoe and raft. Canoes offer a more active rafting trip. No previous rafting experience is necessary. Rafts hold 8-9 people and are manned by a river guide. Lunch is provided with a stop off during the rafting circuit. Antalya Aquarium tells stories from all over the world. You can discover the magic of the underwater world; you can make snowballs from real snow in Snow World or you can swim with sharks and rays that do not pose any danger to people. 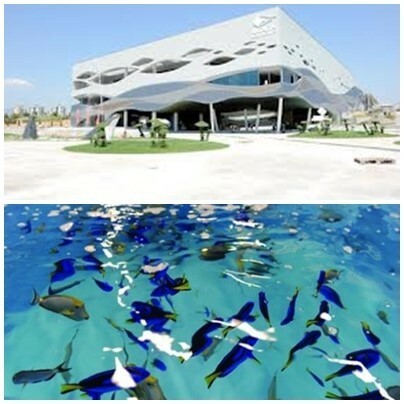 As the one of the world’s biggest aquariums, Antalya Aquarium features inspiration, entertainment and education together. Through a path of more than forty exhibits followed by the world’s biggest underwater tunnel aquarium with 131 meters length and 3 meters width! Transfer to/from hotel will be provided. In an oriental atmosphere with typical Turkish instrument and orchestra. Extravagance program to experience the flavor of worlds and costumes of folklores and Belly Dance. A unique ambiance of good taste and first class service. Dinner and limited beverage included. In the tour we drive through the villages over Taurus Mountains. You can watch the beauty of unique nature. During the tour, we have breaks to take photographs, to see village life, houses and important points. You will have your lunch in a beautiful forest atmosphere and drive on our route back to the meeting point and transfer to the hotels. 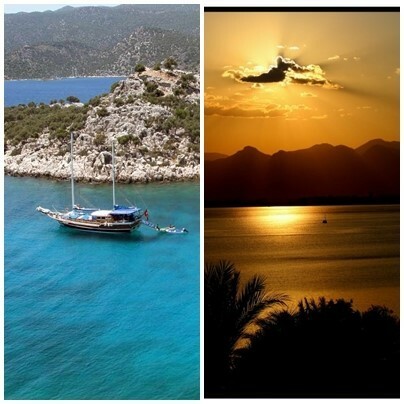 The private car will take you from hotel to Fethiye and on the way you will visit tourist attraction places. 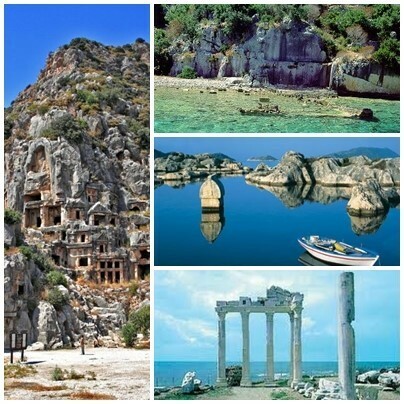 One of them is Kayaköy, has many ruins left from the population exchange between Turkey and Greece in 1923. Beautiful countryside, Turkish village life and a sad reminder of the past. In addition, you will visit Saklikent Gorge. Saklikent, meaning “hidden city” in Turkish, is around 50km from Fethiye in the Mugla province, and a 20-30 minute drive from Kalkan. It is 18km long and 300m deep; one of the deepest canyons in the world. It was opened to the public as a national park in 1996 and it has since proven very popular with tourists. 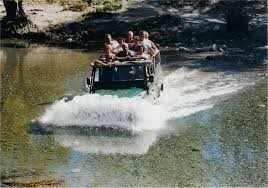 In this tour, visiting points can be arranged according to your demands. *Note: These activities will be run daily depending on the number in the groups. Please check for updates.